Sautéed tiger shrimp accompanied with a garlic and herb butter sauce and a hint of red pepper flakes, served on a bed of spaghetti noodles. Prepared to please, fresh mushrooms and diced tomatoes sautéed with fresh basil combined with a Pecorino cream sauce and our special seasonings. Layers of lasagna noodles, melted cheese and our zesty homemade meat sauce baked until bubbling. A tasty blend of mozzarella, colby, ricotta, romano, Swiss and asiago cheeses melted in layer upon layer of pasta and sweet tomato sauce. Covered with homemade meat sauce and mozzarella cheese, stuffed with your choice of Meat, Cheese or a Combination of both Cheese ravioli served with tomato sauce. Rigatoni pasta tossed with our thick homemade meat sauce, smothered with mozzarella cheese and baked to perfection. The traditional family recipe with ground beef and homemade sausage. Alfredo and tomato sauce blended with our homemade Italian sausage and peas. Fresh from the garden mushrooms, broccoli, cauliflower and carrots sautéed with fresh basil and pecorino cream sauce. Basil, olive oil, pine nuts and tomato sauce. An abundant mixture of succulent shrimp, scallops and crabmeat. 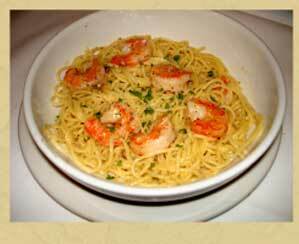 Sautéed with garlic and blended with our homemade alfredo sauce. A wonderful mix of our homemade tomato sauce infused with cream. Salmon and a tangy cream sauce splashed with vodka. A hint of lemon enhances the flavor of this sauce. Tomatoes, fresh basil and secret family seasonings. Tomatoes, garlic, fresh basil and artichokes sautéed in virgin olive oil.